So we are having a bit of a difference of opinion when it comes to mineral water in La Casa de Punk Rock Parents. A while back I saw some S. Pellegrino water on a shelf and I thought "Hmmm do I like mineral water? I don't remember." So I bought a bottle, tried it and found it refreshing and crisp and delicious. As I sipped on my green bottle PR Dad looked at me with pure disgust in his eyes. As if I was sipping on a bottle of piss. I stopped drinking and asked him "What?" and he was all like, " I can't believe you can drink that stuff, its disgusting"
So we decided to ask family members what they thought of mineral water. My sister Ouie (who puts lemon and chili on popcorn!) took one swig and found it gross. So I passed the bottle over to my brother in law Luis and he took a big drink and was like "Oh yea I like this stuff" My Mom is a known mineral water drinker so we moved on to Dad who said "I only drink it if I am hung over"
So basically the family is divided over the whole mineral water is good/gross debate. Do you drink mineral water? I tried reading your post,but the Phi in the background just had me entertained. I won't ask what she is doing. ;) I like the juice. 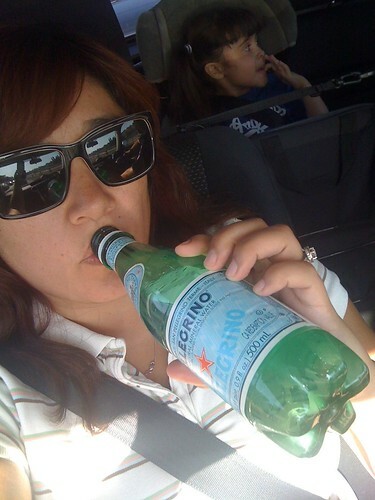 Pellegrino and croissants were a staple back in my skinny days.